When my mom was 11 years old, she and her parents were forced to leave their homes in Sudetenland after Germany lost the war in 1945. They had to leave with nothing but the clothes on their backs and what they could carry in a few small bags. They buried a few treasures in the courtyard outside their homes and left. They had no choice. My mom’s parents would never return. But, after the wall came down and communism crumbled in that part of the world, my mom has been able to go back a few times along with my dad. Mama has returned. Back to her roots, her home, her Heimat. While I was growing up, Mama talked often of Sudetenland, this region, this area, this homeland, her Heimat. She continues to talk about the Sudetenland, and has also mentioned it several times to my daughter, Rachel Marianne, who now lives in Germany with her husband. So, while I am visiting Germany for Rachel’s college graduation, I included some days for traveling together with my daughter in Europe. For doing something different. An adventure for just the two of us. After years of hearing my mom share stories, I wanted to learn more abut my mom’s heritage, her history, her background, this Sudetenland that was a mystery to me. I wanted to walk on the land that my mom grew up on, to breathe the air that she breathed, to view the sites that she took in, to take in the landscape that she took in, to walk on the ground that she played on growing up, to connect with her background, which was so foreign to me as I was raised in the states. But first, a visit to Helga’s in Biberach. Helga is my mom’s first cousin, and Helga’s mom Marianne was my godmother. My middle name is Marianne and my Rachel’s middle name is also Marianne. During our stay with Helga, between walking her dog Yani in the fog saturated fields and woods at dusk and eating meals together, Helga shared her own stories about the Sudetenland, from which she and her family also hailed. Helga also shared about these yearly gatherings she attended in the Sudetenland called Heimat’s Treffungen or, translated means “Heimat gatherings.” The word Heimat is a word that the people who were driven from the Sudetenland often use when referring to their origins, the place where they were born and raised in, but then were driven from after the war. This word Heimat intrigued me more and more listening to Helga share and reflecting on my mom’s stories growing up. Why is this so important to my mom and to Helga and these people have Heimat gatherings each year. 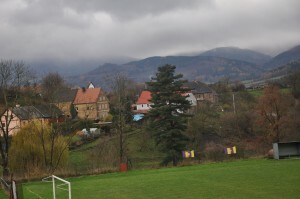 Heimat is a place that connects people to others whose roots are from the same region, the same soil, the same land. 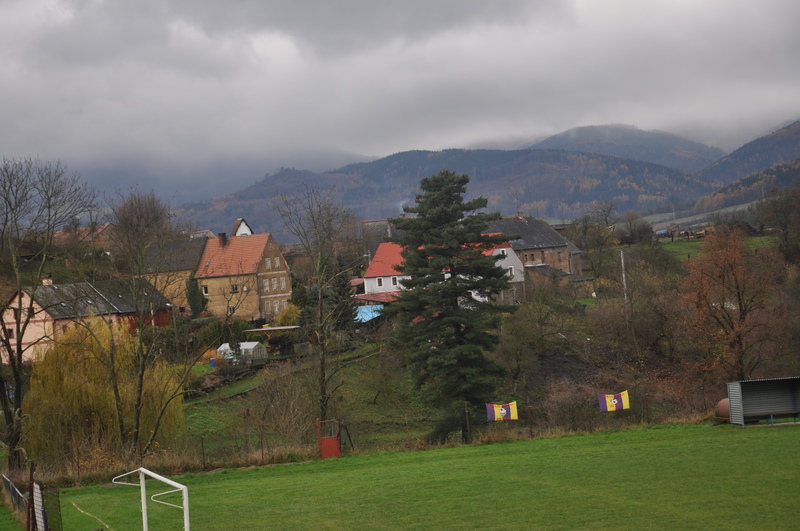 When I think of Heimat I think of connection, stories, roots, belonging, being part of something bigger. It’s connected to soil and land and growth. In the Bible, we were formed from soil. “From the dust, God created Adam.” (Genesis). Our beginnings, where we belong, where we come from help establish who we are today. So, after hearing Helga share about Heimat and the region in Sudetenland, my daughter and I decided we too wanted to go there. To see about this place that was so important to my mom and my second cousin. Helga connected us with some friends of hers in the area, providing a place for us to stay while we searched out my mom’s Heimat area. 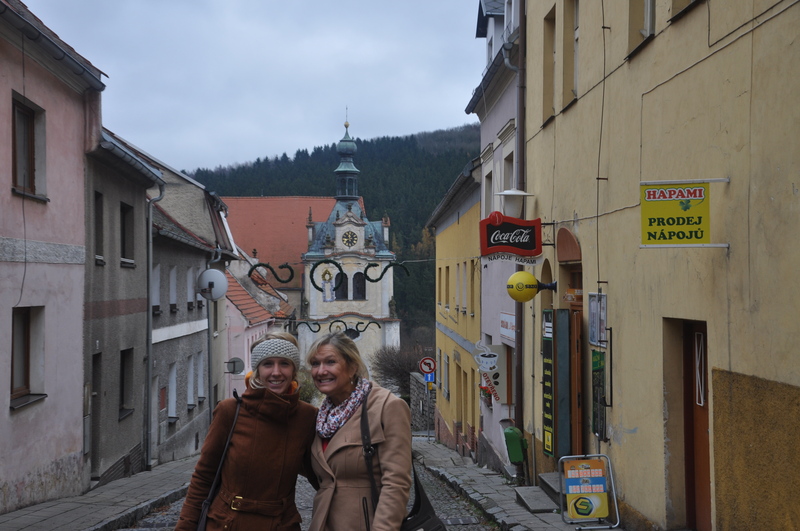 Helga gave us a few places to look for- Wohlau, where my mom was raised, the city of Zlutice, where my mom was baptized, and Lubenec where my mom and dad stayed during their visits to return to their Heimat. Each of these cities had two names: one that was German, the name it was when my mom lived there, and the current Czech name. 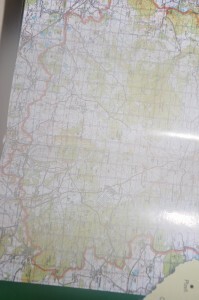 The people we stayed with for our Sudetenland visit, these friends of Helga’s, shared with us stories of their Heimat Gatherings and they showed us maps of the area and they told us that some of the areas that we wanted to see were in “prohibited” areas. In fact, Wohlau, the town that my mom grew up in, was in the prohibited area. And, my mom also told us there was nothing to see anyway. The town is now gone. “There’s nothing to see,” she told us when we called her from Helga’s place. Still, we wanted to go. To see the area, to take in the land, to feel what it was like there. 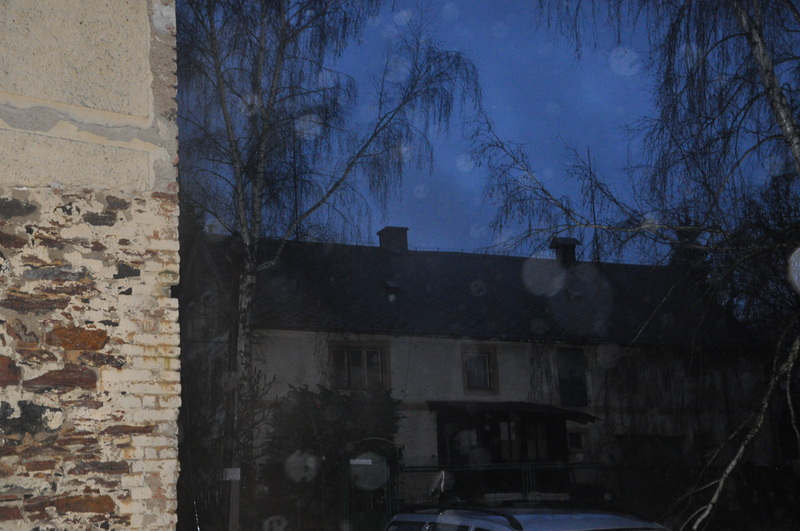 So, my daughter and I, on a rainy Tuesday in Sudetenland, took a drive, map and GPS in hand, we were off. 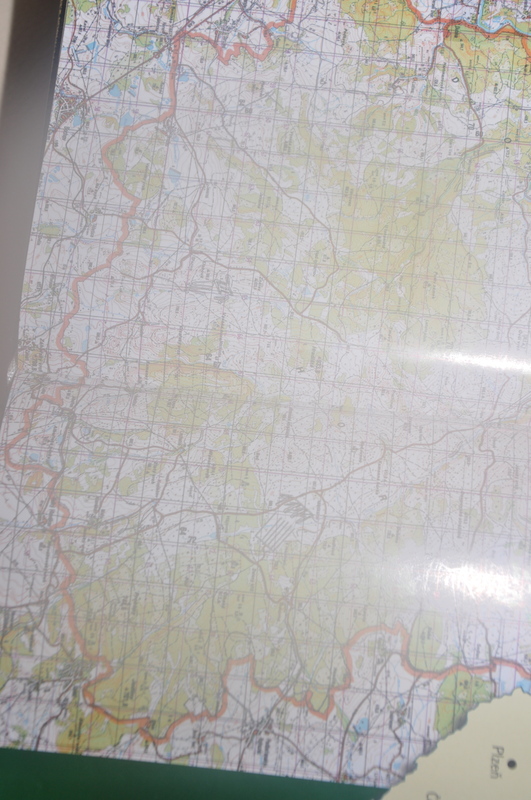 Down windy, twisty roads, with an old map and a couple of new ones. One city led to a village, which led to a smaller village, sometimes with three or four houses. 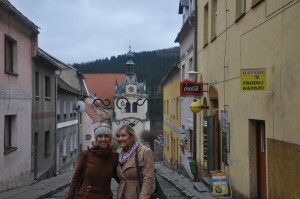 We wondered, where was this Wohlau, this city where my mom was raised. It was in the prohibited zone, so we tried to get to cities nearby. It got darker and darker. We passed through villages named after families who farmed the land. We passed through some villages where there were abandoned houses and buildings. The roads got bumpier and there were turnoffs leading to more deserted areas. We approached this abandoned farmhouse and I got out to use the rest room. Which meant, a tree. It was pouring down rain and almost dusk. I just had to get photos of this abandoned house. There was still a mailbox outside. What were the stories that this house had? Who lived here? What was their family like? Where are they now? Have they ever looked for their Heimat? As I got into the car again, my daughter said there was a wolf-like animal running towards our car. She could not imagine it was a dog because there were no people living out here. That was a sign that it was time to turn around. We did not find the city near Wohlau that was also in prohibited land. We would continue our search the next day. When we had more daylight, we continued to look for the cities near Wohlau. We at least wanted to see a sign that said, “Prohibited zone,” as we had heard there would be signs. The land apparently belonged to NATO. We had asked people where the signs were for the prohibited land were, and they gave us some landmarks, some cities nearby. If we could just find them, then maybe we would see the land that my mom was raised on. But nothing. No signs. So, we moved onto something that should be easier to find. A current city. The city where my mom was baptized in. Zlutice, or Luditz, which is the name it had when my mom was baptized there. We found it and the church. 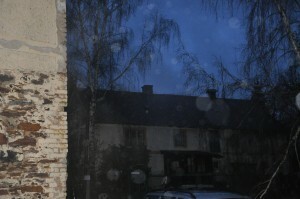 It is in the center of the cobblestoned village. The church is called “Kirche St. Peter und Paul”. The little town has Christmas decorations up. We walked to the church and took pictures of the church and listened to the church bells chime every 15 minutes. And, I had a local person take a picture of my daughter and me in front of the church. Oh, to walk on this land in the Heimat area of my mom gave me such a feeling of connection. And belonging, of roots, of establishment, of beginnings. After we left, we also drove through the town that my parents stayed in when they’ve visited Sudetenland a few years back. Why did I feel I had to go? Maybe, it is the same reason children who are adopted have to search for their birth parents, even if it is just to meet them, or to know where they live. That connection. That history. That sense of roots. I just had to go. To feel more connected to my mom, my roots. To walk on the land, to breathe in the air, to meet some of the people, to take in the area. What an experience. It makes me think about my own parenting now. To make sure I talk about our roots, our area, our land, our home. So that, as our children take their flight into the large wide world, they will always return home. And know they have a place of belonging, a place from which they started, a place where they grew their roots. And, in the end, may my kids know, that we, their family, is ultimately their Heimat. And even more, that God himself is their home. Their place of Connection. Their place of belonging. What a beautifully written article. 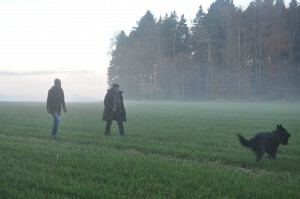 I so love the idea of you and Rachel exploring your roots together: to” experience” as Mother and Daughter; to breathe the air in unison, walk the fog laden fields, search for the lost prohibited area. I imagine this to be one of your most treasured precious memories with each other, for years to come. Thank you for inviting us to experience this journey with you! I cant wait to read about your next adventure.